Dating back to 1909, High Point's Furniture Market is in full swing now. It is the time in the spring (and fall) when furniture buyers and sellers from all over the world converge on the area to showcase their latest designs and to purchase beautifully crafted pieces of furniture. It is the largest furniture trade show in the world. According to current demographics, there are 180 buildings; 11.5 million square feet of showspace; 75,000 attendees at each market; more than 2,000 exhibitors; and 100+ countries represented. * According to a 2013 Duke University study, the event contributes more than 5.4 billion dollars to the area economy. Unfortunately, this sign at the Piedmont Triad airport is about as close as we'll likely get to market; however, we sure do swell with pride knowing that this amazing event is held in our county and in the next city over from Greensboro. Today is ABC Wednesday and for our 2014 Alphabet Soup Round, "M" is for Market, High Point's Furniture Market. Let's hope it is a good one. As we have been documenting over the last few days, this past weekend was a busy one in Greensboro. Above, you see the lobby of the Greensboro Historical Museum after the screening of the documentary made by Montagnard high school students whose families arrived as refugees and immigrants. These new Americans have become historians and filmakers in a project that will be archived at the Smithonian. The above crowd includes not only Montagnard families but also community members who know and care about the stories of this group of people from the Central Highlands of Vietnam. Long before the film project began, Betty Stratford was busy tutoring English Language Learners at Mendenhall Middle School. In collaboration with Lie Rlayang, Betty designed a series of cloth panels telling the story of Lie's journey to America. The scene below is one of Montagnard children learning about life in America through TV- specifically cartoons and sit-coms. Betty was not in attendance on Saturday, as she is not well; however, her husband, students and artwork were there to represent her dedication to Greensboro's immigrant children. 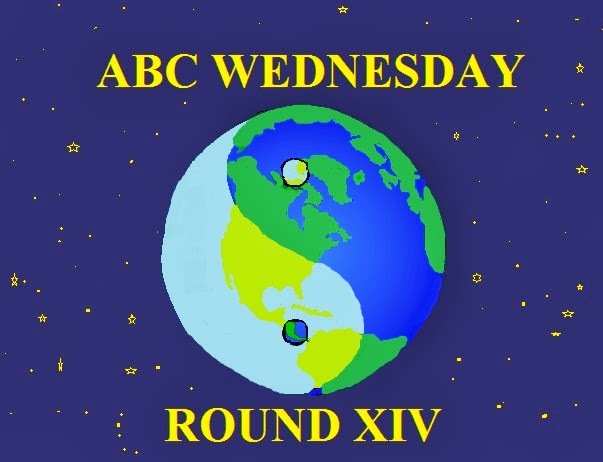 Today is ABC Wednesday and C is for "children." If you get a chance, be sure to watch, The Young Mountaineers: An Untold Story of Montagnard Youth in Greensboro. Located in Summerfield on Highway 150, also known as Oak Ridge Road, at the corner of Deboe Road, is the old Saunders Inn. It was a place where travelers or people relocating could stay, get a good meal, and keep their horse in the outbuildings. In the early 1800's, when Sydney Porter was relocating to Guilford County, he lodged here and actually stayed on to teach innkeeper Hezekiah Saunder's children*. Fast forwarding to 1862, this teacher's grandson, William Sydney Porter, would be born in Guilford County and grow up to become Greensboro's most celebrated writer, O.Henry. Today is ABC Wednesday and this round on Greensboro Daily Photo, our theme is "Alphabet Soup," a serving of whatever comes our way from week to week. We learned of this property from the man who sold us a book about O.Henry's life. B is for Boardinghouse, bed & breakfast, located in northeast Guilford County. *reference and more about Summerfield, here. ** read more here in Summerfield's Town Council Notes from 10/29/2013. It is really interesting tracking the change to our county and seeing how it unfolds.